Humor is usually a good way to make a point. And this picture makes the point I needed to make with a recent client who had difficulty making the distinction between deluded and diluted. Yet another pair of words that sound alike, but should not be used interchangeably. 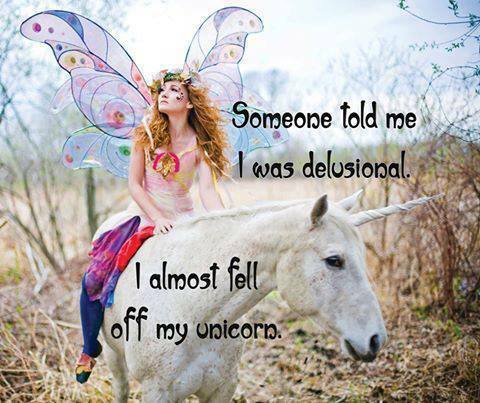 Our young lady on the unicorn is deluded or delusional—deceived. Whether it’s self-delusion—fooling herself—or imposed on her by others—delusion is a disconnection from reality. The Latin root means to mock or to play. If someone is “played for a fool” they are tricked into believing something that is not true. Deluded has no connection to diluted. Diluted means to water down or thin by adding water. The Latin root diluere means to wash away. Any concentrated substance like frozen juice or a cleaner, needs to be diluted or dissolved so it’s at the right proportion for maximum effectiveness. As a new mom I made the mistake of not diluting the juice concentrate for my three-month-old son and wondered why he was so fussy. Diluted can also mean to diminish in strength, force, purity, or brilliance. When someone or something loses power or influence it can be said to be diluted. The senator’s influence was diluted when he eked out a victory over his opponent. A third meaning of diluted relates to stocks, but I would likely delude you if I tried to explain anything relating to the stock market. Diluted should definitely not be confused with dilated. Dilated means to spread out, expand. Don’t bother to tell a laboring woman that “this will only hurt a little.” Though she may not be in complete control of her emotions, you will be considered the delusional one.